The Follow the Leader (FTL) tool is used to create a new shape resulting from the paths taken by all positions of the selected shape. The path is determined by the leader of the shape. To establish the counts where the FTL transition is to begin and end in the drill, set the Red Anchor on the Count Track to the count where the FTL is to end. This is typically the count of the set you are currently working on. Set the Yellow Anchor to the count where the FTL is to begin. This is typically the previous set. 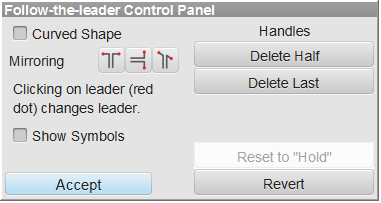 After selecting the shape or shapes you want to perform the FTL transition, clicking on the Follow the Leader tool will display the Follow the Leader Tool Control Panel. A red dot with a green center appears on one end of the shape. This performer is designated as the “leader” of the FTL movement. If the other end of the shape is the preferred “leader”, click on the leader indicator (the red dot) to change the leader to the opposite end of the form. If an existing path can be established for the leader, editing handles will appear along the path. These handles can be dragged creating a new path to the final location. While dragging the editing handles the location of the cursor is displayed in the Console as well as the Largest Stride and Largest Distance. If no existing path has been established there will not be any editing handles visible. Clicking anywhere on the field will create a path to that location. An editing handle will be placed at that location, the path will be drawn and the performers will fill in place behind the leader’s new final location. Each click on the field will extend the path of the leader to the location of each click. A new editing handle will be added at each location. Clicking on an editing handle while holding down the [SHIFT] key will remove the handle from the path. Similarly, clicking along the path between two handles while holding the [SHIFT] key will insert a handle into the path. Fewer cuts the number of handles on the path in half. Each time Fewer is clicked the number of handles is reduced. The Curved Shape option will create a curved path between the handles. When the option is off the path consists of straight lines between the handles. Mirroring Options are available if two or more shapes are selected. When mirroring, the path of the shapes can be set to opposing horizontally, opposing vertically, or opposing both vertically and horizontally.